Step 13: Setting up an external database. Step 14: Change password of superuser "postgres"
SavaPage is a Libre Print Management Solution that uses Open Standards and Commodity Hardware for Secure Pull-Printing, Pay-Per-Print, Tracking and Tracing and PDF Creation that functions on top of CUPS. SavaPage is a Print Server deployed on a central GNU/Linux system. Any workstation or device that supports the Internet Printing Protocol (IPP) or IP Printing (JetDirect), like Windows, Mac and GNU/Linux workstations, can use SavaPage printers. Mac OS X and iOS devices can use AirPrint® . Android and Chrome OS devices can use Google Cloud Print to print to SavaPage. As a backdoor any device can use Web Print and Mail Print to print. When a user prints to SavaPage the printed pages are immediately shown in the SavaPage Web Application that runs in any modern web browser. SavaPage accumulates print jobs per user in a single personal preview where it can be manipulated and pruned before storing or routing it as PDF document. And yes, you can even route to a “real” printer. The SavaPage Web App offers a Common Printing Dialog for printing to printers installed at the server side (proxy printing). This makes SavaPage the only printer you need on your desktop. The SavaPage Web App is optimized for desktop clients as well as mobile devices. This opens up useful scenario's. Like, a user walking up to the printer of his choice and releasing a print job by pushing a button on his smartphone. Administrators on the go can easily monitor the system on their tablet. SavaPage turns printing into a user experience where soft copies are likely to be more attractive than hard copies, and where precious paper, trees and money is saved along the way. And, if printing is needed after all, SavaPage is the logical stopover where, on second thought, n-up, gray-scale and duplex proxy-printing can be applied to reduce the costs of printing to a minimum. So, why print when you can SavaPage? SavaPage is Libre Software licensed under the GNU Affero General Public License (AGPL) version 3 as published by the Free Software Foundation. * Less administration. SavaPage is the one printer you need to print to any printer in your organization. * Zero install. A generic PostScript driver and web browser is all you need to print from Windows, Mac and GNU/Linux and preview the result. * Multi-platform. Corporate printers are sandboxed in the Web App Preview and thus available on all mobile and desktop platforms for pass-through (proxy) printing. * Easy follow-me printing. Several hold-release scenarios, optionally with NFC cards, are supported. Users can even use their own mobile device as print release terminal. * Mobile printing. Google Cloud Print, iOS AirPrint®, Web Print and Mail Print is supported out of the box. * Think before you print. SavaPage Web App shows a print preview that makes you think twice. Do you really need to print all these pages? * Eco-friendly. Create environmental awareness by drawing end-user attention to the cost of printing, and save precious paper, trees and money along the way. * Reduction of printing costs. Remove unnecessary pages and graphics. Save as PDF, or route to a "real" printer with n-up, gray-scale and duplex to reduce printing costs. * No pre-printed paper needed. Eliminate the cost of pre-printed paper. Create virtual letterheads and apply them to any print job. * Libre Software and Open Standards above Proprietary Software. * Commodity Hardware above expensive Proprietary Devices. * Peer-To-Peer Cooperation above Centralized Corporation. The SavaPage Community is there to help. - Generic PostScript Driver print from Windows, Mac OS X and GNU/Linux. - Google Cloud Print from Android and Chrome OS. - AirPrint® from iOS (iPad, iPhone). - Web Print and Mail Print to print from any device. - Username/Password, ID/PIN and NFC Card authentication. - LDAP (Active Directory) Integration. - Raspberry Pi Network Card Reader. - Real-time print preview with Browse, Sort and Delete options. - Server-side Proxy Printing (no local drivers needed). - PDF Download or Email of accumulated print jobs. - Option to remove graphics from PDF and proxy print output. - Innovative Eco Print to reduce ink and toner cost. - Delegated Print for delegates to proxy print for other users and groups. - Job Ticket Print for voluminous proxy print jobs. - Comprehensive Web App to configure the SavaPage environment. - Online Payments (credit cards, bank accounts, Bitcoin). - Command-Line Interface to server methods. - Third party Database support. - External Print Suppliers (Smartschool). - Third Party Print Management Systems (PaperCut). - User Manual in PDF, EPUB and HTML format. This howto describes the procedure to install SavaPage on a NethServer7 server. There are still some loose ends that need discussion. SavaPage needs several applications that are installed on most distributions by default. Write the full path of COMMAND(s) to standard output. Strings is part of binutils package. Check with rpm -qa | grep binutils. Install with yum install binutils. Install with: yum install perl. SavaPage runs and installs under a system user account called savapage. This account is fixed, you cannot choose another name. You are free though to pick a location for the application. However, GNU/Linux Filesystem Hierarchy Standard (FHS) dictates that the application is installed in the /opt/savapage directory. For Samba, just edit the /etc/samba/smb.conf file and disable the [printers] share definition. SavaPage uses several ports. They must be opened in Shorewall. Some parts of the installation require root privileges. If the savapage user has these privileges, you can let them be done by the savapage user, otherwise you will be prompted for root credentials. 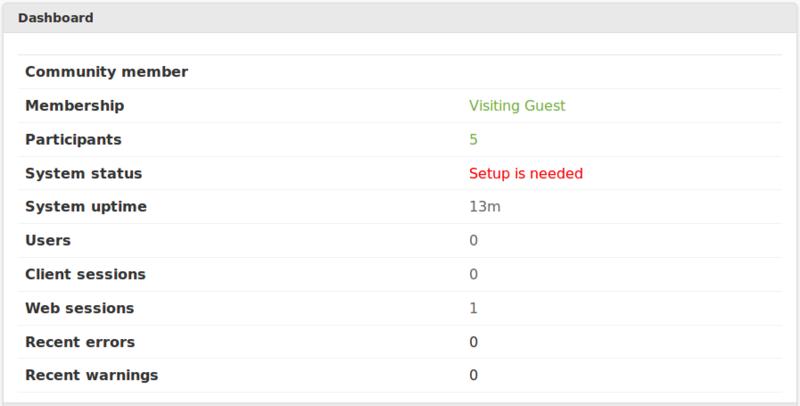 After install you can access the savapage admin webinterface at https://yourserver:8632/admin Log in with user: admin and passwd admin. Change this immediately after logging in. See the /opt/savapage/server/providers/cups/linux/roottasks script, and https://issues.savapage.org/view.php?id=692 why this is done. Later in the install process you need to configure an external (PostgGreSQL) database. In order to populate this databse properly, you need a backup of your default internal database. Creating a backup can be done through the webinterface of the admin or through the commandline. then on the right side: click backups and the backup now button. Stop the SavaPage service: sudo systemctl savapage.service stop. By default SavaPage uses an internal database. For production this must change in order to prevent a hanging and unresponsive system. Your whole server can hang if you have too many concurrent printjobs using the internal server. SavaPage currently supports PosgreSQL as external database. By initializing postgresql the postgresql.conf and pg_hba.conf (amongst others) are created. These are the main configuration files we need to tweak postgresql. By default, PostgreSQL does not allow password authentication. We will change that by editing its host-based authentication (HBA) configuration. NOTE: if PostgreSQL is installed on the same server as SavaPage, you can leave it as it is, and accept the defaults, i.e. access from localhost only. P.S. in that case, you might consider setting the “password_encryption = on” anyhow. By default TCP/IP connections are disabled from remote computers. To enable access from remote computers uncomment listen_address. If PostgreSQL is on the same server as SavaPage, you can keep listenaddress as localhost. and type your new password when asked for it. Type ‘\q’ and hit enter to quit. Initialize the database for SavaPage. If you already have printers and users in the local database, do a backup of the internal database first. In step 12 you created a backup of the default database. Start the SavaPage service as root or sudo user. Type exit to return to root user. Now head over to https://yourNS7server:8632/admin You will be able to log in with the admin account. Default password is admin, if you didn’t already change this, now is a good time to do so. When you log in the admin interface for the first time you will see the dashboard. On the right there is an overview of your SavaPage install. You will notice a “Setup is needed” in red. This means that the initial configuration for SavaPage has not been done yet. (If not already done) Change the admin password As a first security measure change the master password for the built-in admin account. This account is independent and not related to the operating system or domain. The password needs to meet minimum strength requirements, and must contain at least six characters. Select Options → Advanced → Reset internal admin password Enter and confirm the new password and press the Apply button. Set Locale Set the system's locale; ensure that these are correct before proceeding. Select Options → Advanced → Locale, and enter the locale string. Some examples are: en, en-GB, en-US, nl, nl-NL, nl-BE. You can leave the locale empty to accept the system default. The locale is applied to all system messages which are logged in the system log or send by email. Set Currency Code Set the system's currency code; ensure that these are correct before proceeding. Select Options → Financial, and enter the ISO 4217 Currency code. Some examples are: USD, EUR, GBP. The currency symbol is determined in the context of the user or system locale. Set User Source SavaPage optionally imports user information from a Unix (PAM, NIS, etc.) or LDAP source. Select Options → User Source. Select Unix if the user accounts are setup and defined on the local system as standard Unix accounts or mapped into the system from a central directory service such as LDAP via nsswitch.conf and PAM. Most large established networks will use this option. Note: For administrators wishing to customize the PAM authentication method at the application level, SavaPage reports itself as “savapage”. 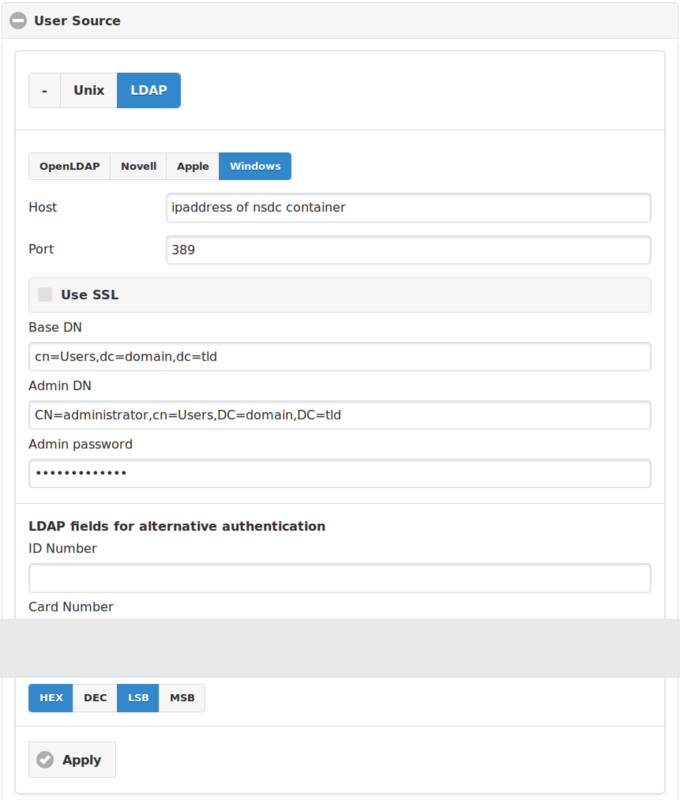 The LDAP option is appropriate for large networks with existing LDAP domains. This includes networks running OpenLDAP, Apple Open Directory, Novell eDirectory and Microsoft Active Directory. More information on LDAP is available in Section 4.10.1.2, “LDAP”. After selecting the source, enter the necessary parameters (LDAP only) and press the Apply button. Adjust the settings to what you have chosen for Samba4 AD information on your NethServer7 instance. User Synchronization Skip this step if you did not set an external User Source in the previous step. Otherwise, select Options → User Creation → Synchronization → Synchronize now to import users. Important An option exists to import a subset of users from the source by selecting a group. This option is relevant if only a subset of users will ever use SavaPage. Select Options → User Creation → Change Group to select the group. Tip Test the import first by pushing the Test button. A simulated import will start, with each step echoed below the button, so you can verify the effect of your action. Set Mail Options Select Options → Mail, enter the SMTP and Message options and press the Apply button. Data from the Messages section is used for system generated mail messages. You can send a test mail message to a recipient of your choice by pressing the Test button after you applied the changes. Driverless Printing Mail Print and Web Print are disabled by default. You can enable and configure these options at Options → Mail Print and Options → Web Print. If you enabled one of the driverless printing options, decide which PDF converters you want to enable at Options → Advanced → Converters. Beware that you might need to install the converter software on the SavaPage host. Share SavaPage Client Files SavaPage client files are located in directory /opt/savapage/client. This includes the SavaPage Printer Driver and JMX related files. It is useful to share this directory over the network so users can use, copy or install the files they need on their workstation. Common sharing methods include: • Samba - used to share files to Windows based workstations. GUI tools are available on GNU/Linux to help you with sharing the client directory via Samba. However, some system administrators may be more comfortable creating the share by hand-editing the /etc/samba/smb.conf file. The following configuration will share the directory in read-only form: [savapage-client] path = /opt/savapage/client comment = SavaPage Client public = yes only guest = yes read only = yes • NFS - a popular sharing method used for GNU/Linux and Unix based workstations. Note The /opt/savapage/client directory is standard shared via the client/ URL. Testing Now the installation is complete, it is time to do a basic test to check if the system is ready-to-use. Pick a workstation and login as a user that is part of the user source as configured in “Set User Source”. Install the SavaPage Printer Driver. See the instructions at Section 10.1 of the SavaPage user manual: https://www.savapage.org/docs/manual/ch-printer.html#ch-printer-driver, “Printing with a Driver”. Login to the Web App with the same credentials as used in the workstation login. Print a test document such as a web page or basic document to the SavaPage printer. Thumbnail images of the printed pages should appear in the Web App.